When it comes to modern design, we can't all be award-winning, but we can all take on a little DIY now and then. Here, we present some of our favorite DIY supplies and projects from over the years. Try your hand at some of these fun tutorials and ideas for your own enjoyment or as gifts! Sometimes the pursuit of a simple accessory can result in a surprising upshot. 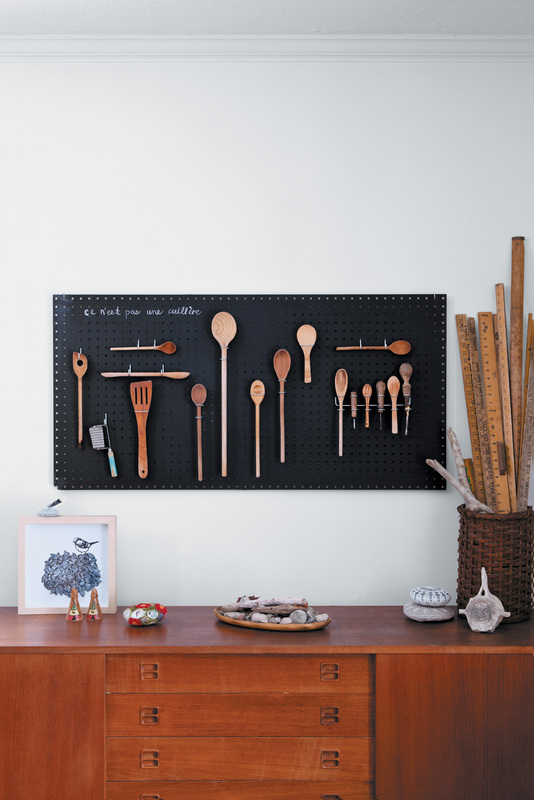 Margaret Oomen was well into the process of reappropriating a portion of her dining room for use as a creative studio, but six months of searching for the perfect vintage pegboard turned up no solid leads. Oomen, a family doctor and crafty blogger based north of Toronto, had conceded to purchase a new one when ingenuity struck in the aisles of Home Depot. Simple, useful, and customizable felt coffee cozies are cherished gifts for coworkers, teachers, and of course, your resident caffeine addict. Whether you want to stick to the vintage style of Norwegian Cathrineholm enamelware (shown) or vary off with your own design, paper-covered votive candleholders are quick and easy DIY gifts. If you’re up for a bigger challenge, try Glassybaby-inspired water balloon votive holders made out of paraffin wax. Japanese Washi Tape is a staple in any crafters box. Made of washi/rice paper, it is semi-transparent and can be reused, repositioned, and easily removed. Taking us back to the basics, these branch hooks require only a tree branch, knife, sandpaper, varnish or paint, and a way to connect it to the wall. Pretty simple, yet makes for a clever gift. Four paper cups + two tooth picks + iPod with classic earbuds = affordable and modern looking DIY speakers. Lighting your home with a flare of design doesn't have to be expensive. Give a handmade woven lamp to brighten another's living space while also adding a hanging piece of inspiration to their home. Spice up your DIY skills using the light sensitive dye Inkodye. The sun-activated dye can be used on textiles, wood, and any natural fiber. Just one of the many Inkodye-based projects, this fabric zipper pouch is a great gift for all ages. It's true, foldout road maps are on the way out. Clean out your glove box and put those old maps to use. Recycled road map corkboards are a quick DIY gift idea for the beloved traveler, geography buff, or your college road trip partner-in-crime. Lotta Jansdotter is an icon of DIY design, and her Simple Sewing book is a resource of unintimidating patterns for newbie and veteran seamsters and seamstresses. We are quite excited to share a new book from Laurence King Publishing called DIY Furniture: A Step-by-Step Guide by Christopher Stuart of Luur Design. The real coup in this book, however, is not that it comes with a bunch of ideas for desks, and sofas, and chairs, but that they tell you how to make objects by established furniture designers.